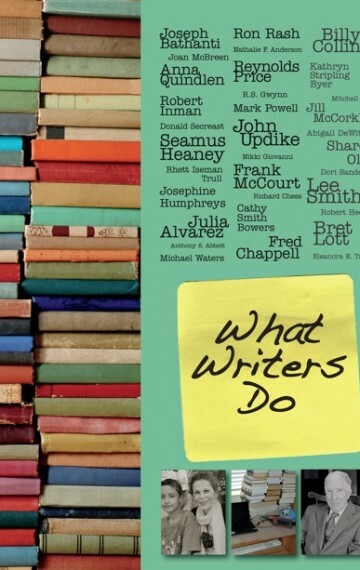 What Writers Do, with its behind the scenes look at the craft of writing, celebrates the series that continues to connect great writers with delighted readers. For more than 20 years the Visiting Writers Series at Lenoir-Rhyne University has championed great writers — both established and emerging. Rand Brandes, series founder and editor, and Anthony Abbott, this volume’s editor, have brought together some of the series’ most beloved and memorable writers to form a collection that includes: new prose by Bret Lott, Mark Powell and Dori Sanders; new poems by Sharon Olds, Fred Chappell and Billy Collins; and classic memoir excerpts by the likes of John Updike, Reynolds Price and Frank McCourt. More than words, this volume also features photographs of the writers and where they work. A handsome man with silver hair and dark eyebrows, Gold wears a black crew neck sweater with jeans for our interview and appears the epitome of comfort but it wasn’t always the case. As a boy growing up in New Jersey in the 1960s he was anything but comfortable in his own skin. As he came to terms with the fact he was gay, he was consumed by “a black cloud,” unable to ever be fully happy. At first keeping his secret required multi-tasking, but then it escalated to the point where he led two separate lives, one falsely straight, the other gay. By the time he went to college he was an emotional wreck. Fortunately, he asked for help and a psychiatrist led him to accept that being gay was not something that could, or should, be cured. Reaching this realization Gold says was “like being born again” and he reset his course. To date, his journey has led him to great professional and personal success. In 1989, with Bob Williams, he founded Mitchell Gold + Bob Williams with $60,000 and 23 employees; twenty years later, the company posted sales in excess of $100 million and had more than 700 on its payroll. Gold’s spacious office, cozy and quirky at the same time, is decorated with the company’s elegant, yet unpretentious, furniture. His desk plays host to organized clutter punctuated by accessories like a giant silver clothespin and touristy snow globes. The company’s manifesto begins: We provide comfort. For everyone. And ends: We are on a mission to make the world a more comfortable place. Even the company’s address, One Comfortable Place, underscores the goal. It’s a goal Mitchell Gold pursues outside the workplace as well. Over the years Gold has lent his time and resources to various civil rights organizations. After observing an across the board reluctance to confront religion-based bigotry as the leading barrier to full equality – especially for lesbian, gay, bisexual and transgender individuals – he founded Faith in America. Committed to confronting prejudice and hostility disguised as religious belief, the organization garnered national media attention. “Because,” Gold looked down at his feet and said, “I don’t want one more kid to go through what I did.” He told the reporter of his teenage fears. He talked about his loneliness, depression, his plan to take his own life by age 21 if he were unable to “change”– things he never talked about. Especially with a member of the press. And that was the problem: Nice people had no idea.